Global Parenteral Nutrition Market expected to reach around USD 4.39 billion by 2024, growing at a CAGR of 15.8% between 2018 and 2024. Parenteral nutrition has been used in clinical practice for over a quarter of a century. It provides better nutritional requirements for optimal growth and maturation of the person. The report covers forecast and analysis for the parenteral nutrition market on a global and regional level. The study provides historical data from 2015, 2016, and 2017 along with a forecast from 2018 to 2024 based on revenue (USD Billion). The study includes drivers and restraints for the parenteral nutrition market along with the impact they have on the demand over the forecast period. Additionally, the report includes the study of opportunities available in the parenteral nutrition market on a global level. In order to give the users of this report a comprehensive view of the parenteral nutrition market, we have included competitive landscape and analysis of Porter’s Five Forces model for the market. The study encompasses a market attractiveness analysis, wherein all segments are benchmarked based on their market size, growth rate, and general attractiveness. The report provides company market share analysis in order to give a broader overview of the key players in the market. In addition, the report also covers key strategic developments of the market including acquisitions & mergers, new product launch, agreements, partnerships, collaborations & joint ventures, research & development, regional expansion of major participants involved in the market on the global and regional basis. The study provides a decisive view of the parenteral nutrition market by segmenting the market based on nutrition type, end-users, and regions. All the segments have been analyzed based on present and future trends and the market is estimated from 2018 to 2024. 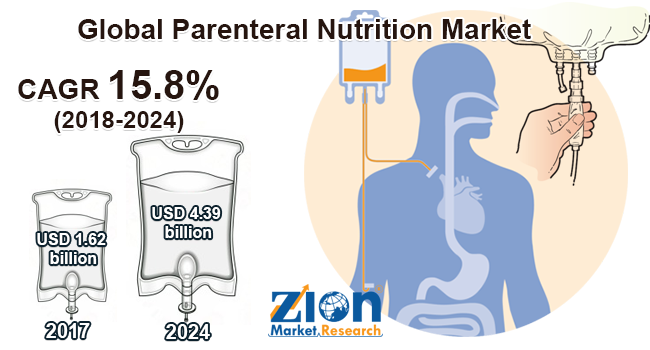 By nutrient type the global parenteral nutrition market is divided into carbohydrates, single dose amino acid solution, parenteral lipid emulsion, vitamins and minerals, and trace elements. Single dose amino acid solutions are largely being employed in numerous parenteral therapies. The carbohydrate segment dominated the global parenteral nutrition market accounting major global revenue share. Single dose amino acid solutions and lipid emulsion were the fastest growing segments. Based on the end user segment, the global parenteral nutrition market is segmented into hospitals, clinics, and others. The hospital segment accounted for a maximum share from the end user segment. The regional segmentation includes the current and forecast demand for North America, Europe, Asia Pacific, Latin America, and the Middle East & Africa with its further bifurcation into major countries including the U.S. Germany, France, UK, China, Japan, India, and Brazil. This segmentation includes demand for parenteral nutrition based on individual segment and applications in all the regions and countries. Some of the key players in parenteral nutrition market include Baxter International, Inc., B. Braun Melsungen AG, Allergan Plc, Grifols, S.A., Hospira, Otsuka Pharmaceutical Factory Inc., Fresenius Kabi AG, Sichuan Kelun Pharmaceutical Co., Ltd., Vifor Pharma, and Aculife Healthcare, among others.